Guardian360 launched the Guardian360 App - Guardian360. Recently, Guardian360 launched the Guardian360 App. With this app Guardian360 is extending their services, and make it possible for partners to demonstrate the Guardian360 services to their customers. De Guardian360 App offers a demo-environment of Guardian360’s dashboard and a few details are displayed. The Guardian360 QuickScan is available in the App now! The detected vulnerabilities and non-conformities are shown in a clear manner to the user. 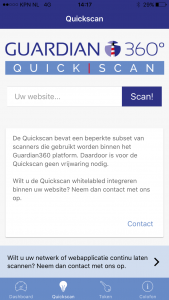 Users are able to easily scan websites, with the QuickScan, integrated in the App. Besides that, the App generates an unique code with which the user is able to log in to the new Guardian360 platform: Lighthouse. At last, the user is able to contact the Quardian360 personnel quick and easily via the App.